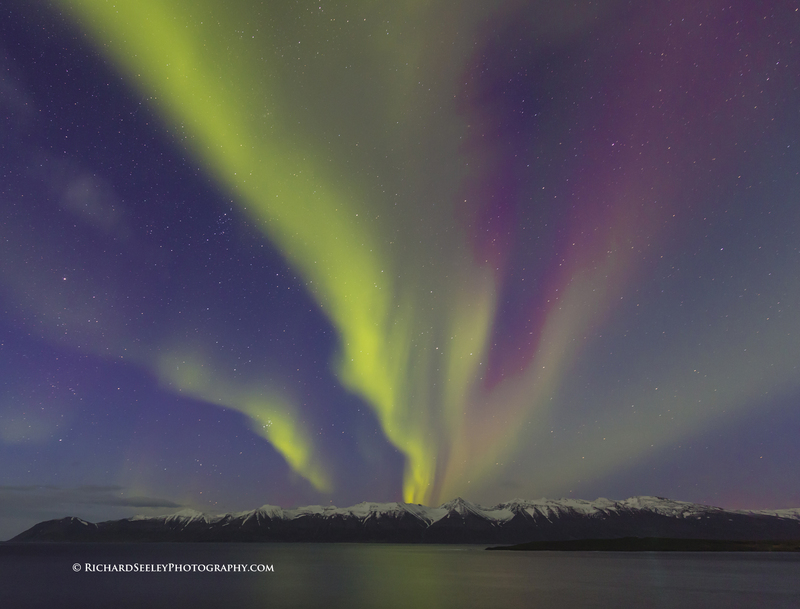 The aurora borealis has always been a phenomenon of interest, but never an exciting photographic pursuit for me. It is visible mostly in the fall and the winter months in the higher latitudes of planet Earth (Arctic and Antarctic) and is also know as the Northern Lights in the northern latitudes. When the solar wind carries a stream of highly charged electrons from the sun that collide with the oxygen and nitrogen atoms in the upper atmosphere of earth, the emissions are the colors of the aurora. 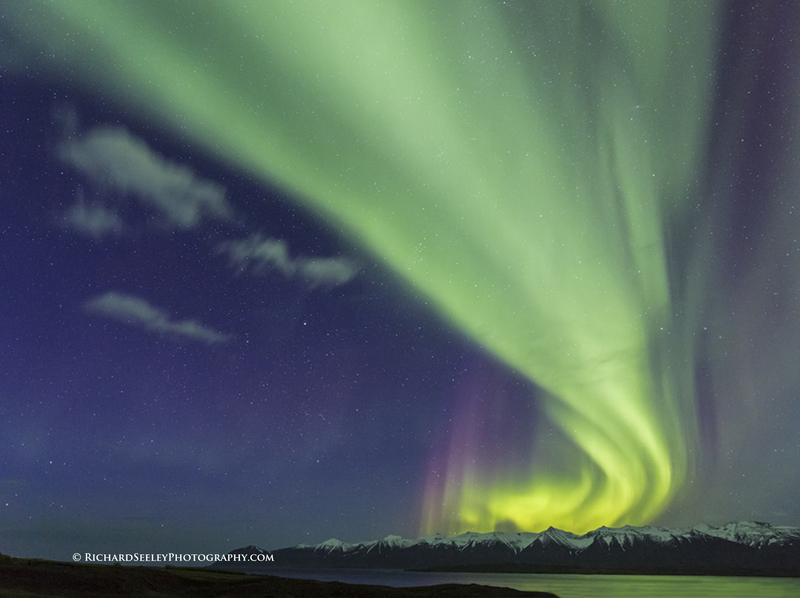 The aurora can be seen in green, red, yellow, pink and blue colors, but is mostly visible in green. My attitude towards the aurora changed in a recent visit to Iceland, a place where auroras are a frequent nighttime light show. I became hooked on aurora hunting. 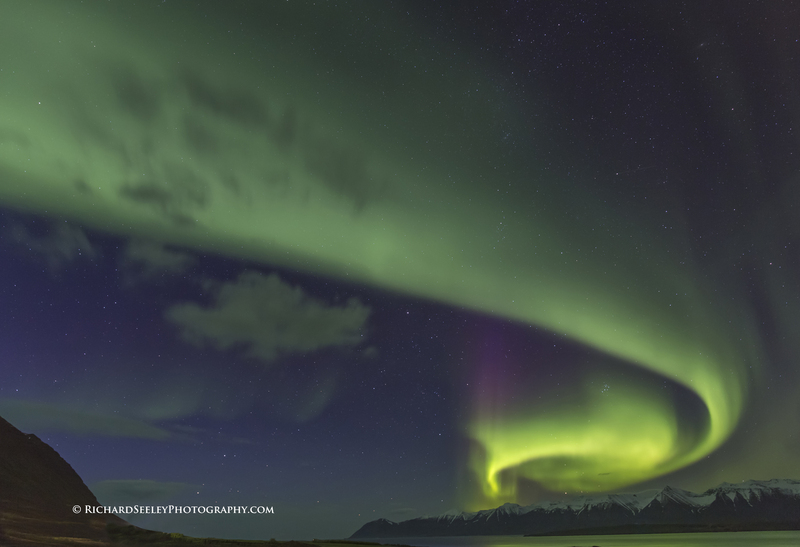 While my photography pal Bob Karcz and I traveled the roads of Iceland in search of the next photo opportunity, we were constantly mindful of the perfect location of an aurora sighting for that night. 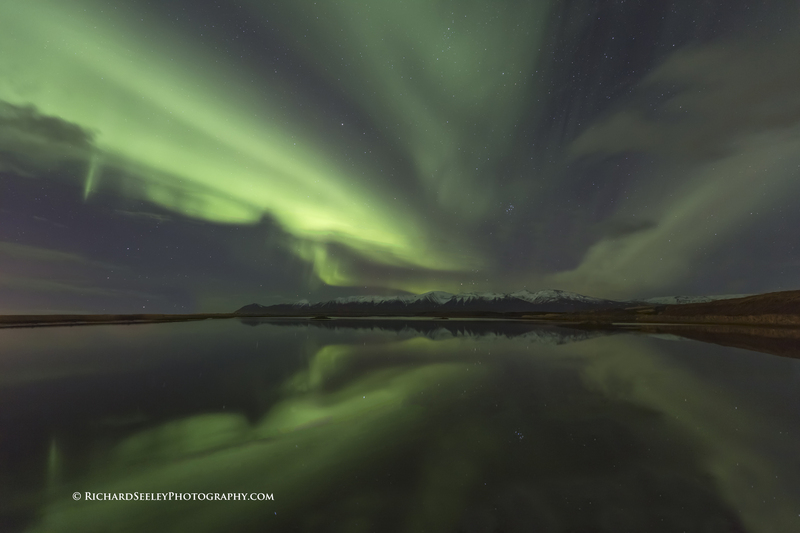 To capture the aurora on camera required clear skies (a rare event in Iceland), dark skies (no lights from nearby towns), mountains in the foreground (makes for a good composition), water for a reflection, (if possible) and, of course, a solar wind collision event. No small task. Then, there are the 10 or so camera settings that must be just right to capture the image on camera. ~ by richardseeley on October 14, 2014. Breathtaking Rich…I got to go see it first hand! Breathtaking Rich…I got to go and see it first hand! Great pix of the Aurora Borealis, about the best I’ve ever seen. You must have gotten some really good bird shots in Iceland also. Amazing its that cold already in Iceland! I mean it is Iceland, but its only September! Beautiful! Rich- they look great- you nailed it!! Fantastiques photos Rich !! merveilleuses et incroyables ! !